shoots and on-site location shoots. 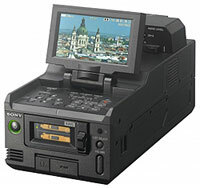 The Sony PMW-RX50 mobile recorder plays and records Full HD XAVC Intra and XAVC Long GOP, as well as MPEG HD 422 50 Mbps, MPEG HD 420 35Mbps, MPEG IMX and DVCAM, making it the ideal companion deck for XAVC camcorders. As the successor to the PMW-50, the PMW-RX50 has a lot of attractive features, including dual SxS memory card slots offering dual simultaneous recordings, 3G HD/SD-SDI interface and 1080 59.94/50P workflow support and conversion output from 1080/59.94P (50P) to 1080/59.94i (50i). The recorder also has XLR audio input via a removable Audio Box. DC output is also provided for the CBK-WA100 mobile network 3G / 4G / LTE / wireless LAN adaptor. Records Full HD XAVC Intra and XAVC Long GOP at 1080/59.94, 50P. Can record to two SxS memory cards simultaneously. Supports CBK-WA100 mobile network wireless LAN adaptor. trol, HyperGamma, and many more. A wide range of connectors, including 3G/HD/SD-SDI, HDMI and USB, increase the flexibility further. The Sony PMW-RX50 is a lightweight, rugged handheld recorder/player offering full portability for news and field operations. The unit is designed to be tough and insensitive to vibrations and can be operated on BP-U battery. The Sony PMW-RX50 acts as a stand-alone multi format SxS viewer ordesktop SNG Card feeder. The Sony PMW-RX50 plays and records Full HD XAVC Intra and XAVC Long GOP in exFAT mode. It records 1920 x 1080 59.94P, 50P, 59.94i, 50i, 29.97P, 23.98P and 25P, as well as 1280 x720 59.94P and 50P. The PMW-RX50 also supports MPEG HD 422 50 Mbps, MPEG HD 420 35Mbps, MPEG IMX and DVCAM. The Sony PMW-RX50 can record to two SxS memory cards simultaneously and enables second/parallel recording with embedded audio via HD/SD-SDI inputs. The Sony PMW-RX50 features an HD/SD-SDI interface along HDMI out, iLink interface, USB, stereo earphone and XLR audio input via a removable Audio Box. The Sony PMW-RX50 has 5 assignable buttons for users to set any functions they want to use, including LCD, BRI and Display. DC output is provided for the CBK-WA100 mobile network 3G / 4G / LTE / wireless LAN adaptor.